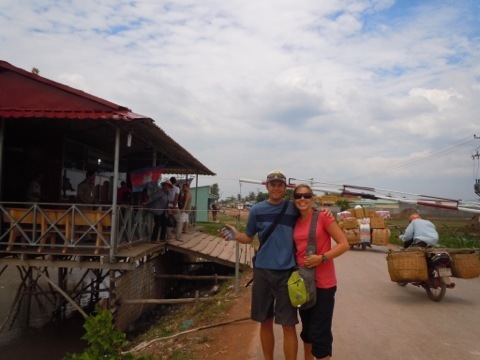 Bus travel in Cambodia is not difficult, but it does tend to take longer than projected. I’m sure it’s because of the frequent stops to let people off at their houses. It’s not as frustrating as you’d think, at least not for me, because a) I get to see where people live and b) I love the fact that the bus actually provides this service. We got into Kep in the early evening and caught a tuk tuk up to Jasmine Valley eco-resort where we’d be staying for the next few days. It became clear why just one driver stepped forward when we told them where we were headed: this was off-road tuk tuking. 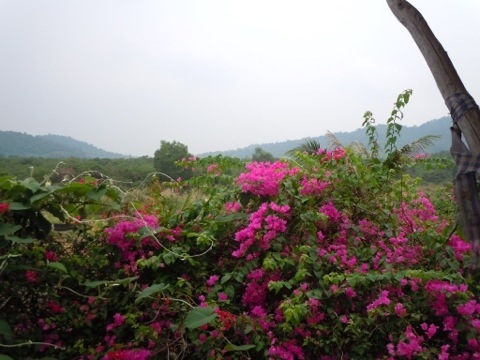 Jasmine Valley is located about 1.5 km off the main road, which is great because it’s set into the mountain and jungle, but it’s a…strenuous…journey for the local mode of transport. We bumped and bounced and vroomed up the dirt road, avoiding ditches and the occasional cow. 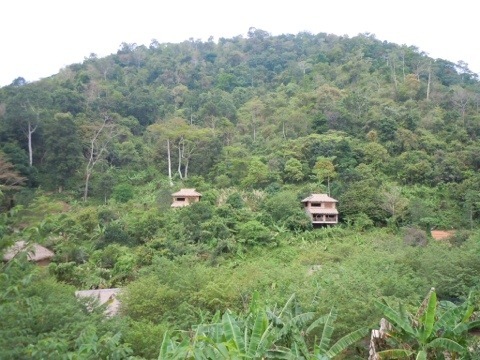 The resort is very eco, but seriously cool. 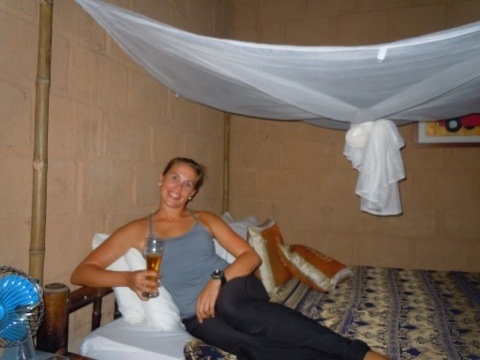 We were in a mud/thatch hut for the first night; it was nice to open the window wide and be able to hear the various night noises. 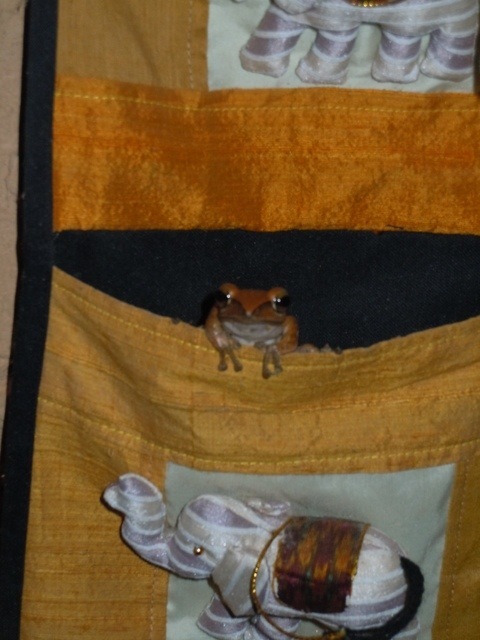 The little tree frog who greeted us from the wall hanging was a surprise, too. However, after glimpsing the tree houses with huge balconies, we decided that we needed an upgrade. It was totally worth it for the extra space to lounge and the cross-breezes. On our last night in Kep, we were lucky enough to have a fantastic thunderstorm; we sat out on the balcony and enjoyed the show. 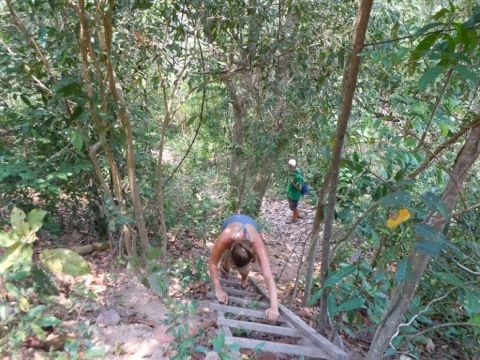 While not large, the Kep National Forest is extremely well marked and has some easy paths that meander around the mountain, providing great views of the Cambodian coastline and, on a clear day, Vietnam. The “Squirrel Association,” affiliated with the LedZep Cafe, has mapped the area and ensured that the paths are clear of land mines. 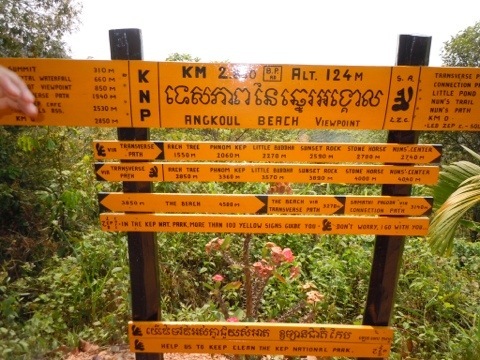 As Kep was occupied by the Khmer Rouge, land mines were (and are) a real hazard; hikers are cautioned to stay in the marked paths. 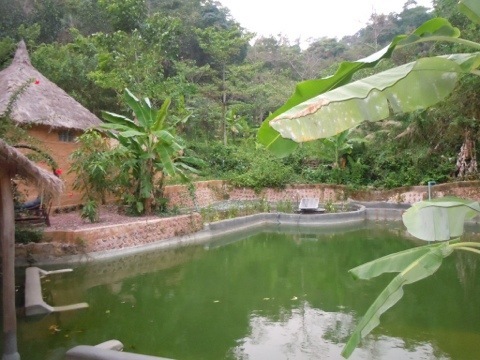 If you’re in the area, definitely check out LedZep as the views are great and they have some great pictures of what Kep looked like in the 60s when it was a posh beach resort. 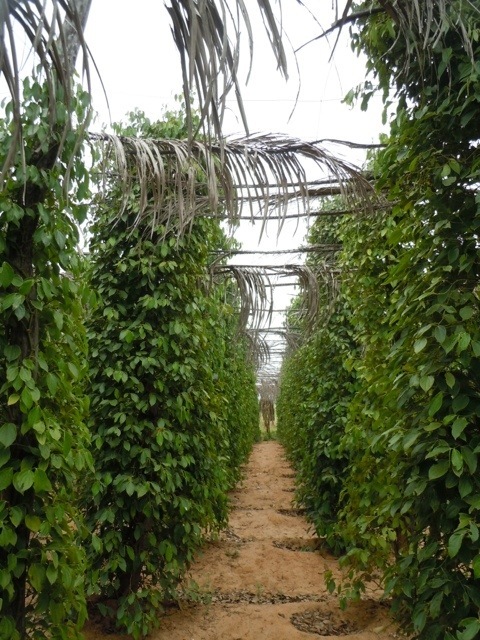 In addition to its past reputation as a vacation destination, Kep is also known for its pepper farms. We decided to check out the Vine Retreat, another recommended resort, to see their pepper farm and get lunch. As I had fallen in love with the Kep Pepper Noodles at the Jasmine, I was excited to see the source. Pepper grows on a vine (I had no idea!) and the road leading to The Vine has a multitude of farms growing pepper, bananas, mangos, etc. The red soil, whose dust has indelibly marked my clothes, reminds me of south GA clay and is what makes this region so fertile. Kep pepper is strong and slightly sweet with a distinctive flavor; it’s what makes the Kep pepper crab a must-try dish in this area. We saw the bunches of red and green peppercorns peeking from the stalks and the baskets with peppercorns drying, learned about the different colors and even tried some right off the vine. It was a great prelude to lunch. 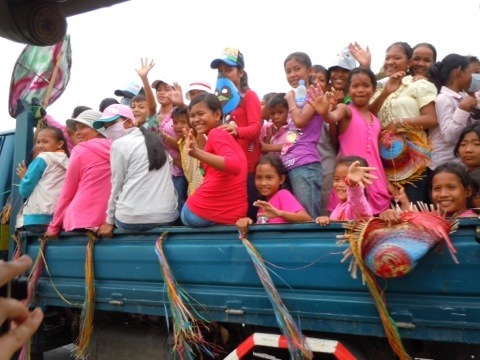 On the way back to town, we saw a line up tuk-tuks ahead, filled with laughing, screaming children. There was music playing, a guy riding backwards on a moto filming, and approximately 150 kids decked out in costumes, rattling homemade noisemakers and cheering with abandon. 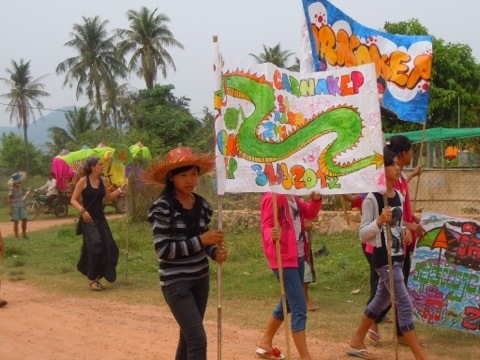 We had crashed CarnaKep, an annual festival organized by the French school in Kep. Our tuk-tuk driver saw how much fun we were having, waving at the kids and taking pictures, dancing along to the music, so he followed the line of trucks, motos and bikes to the school where even more kids were waiting, organized into a parade line, or piling into even more vehicles. We stayed for a while, watching the teachers attempt to take the chaos, until they noticed that our tuk-tuk was far from full. We soon had three ladies and two babies comfortably situated in the front bench, nodding their thanks. Finally, we were off: the parade was moving. It was a true spectacle of sight and sound: the kids were adorned with face paint and handmade masks (Angry Birds was a common favorite); three girls, clearly the parade princesses, were dressed to the nines in boas, tottering on high heels in the dust. There were frequent starts and stops as the parade snaked its way to the beach, giving each segment time to catch up and for parents and locals to join in the craziness. We were fully caught up in the frenzy, cheering and waving, encouraging the mini-Michael Jackson look-alike as he moonwalked across the truck bed, acting as DJ the entire time. 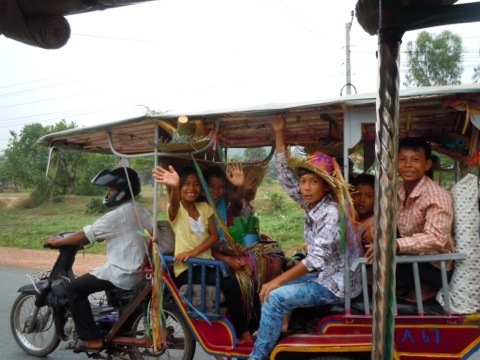 Our tuk-tuk gained several more passengers as four screeching boys ran up and grabbed onto the sides, catching a ride for a few meters before running off again. My cheeks ached from smiling and my arm was drooping from waving. As we approached the beach, more and more Kep residents turned out to see the melee. And, just as quickly as it started, it was over–at least, for us. Our tuk-tuk driver pulled over to the curb and the ladies, babies and the three of us scrambled out. 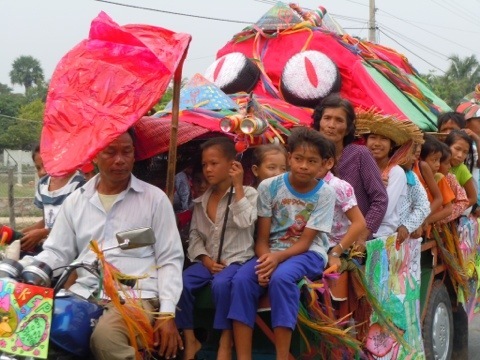 The parade gathered in the town square with announcements, more music and the papier-mâché dragon dancing around the periphery. We stood, a bit forlornly, on the outskirts, watching dark clouds gather over the water. It was time to go, before the bottom fell out. But we had one more mission before we left: we had to try Kep pepper crab. The town’s most famous dish, Kep pepper crab is served in fine restaurants and on the beach-side platforms to both rich and poor. We scuttled into a restaurant and placed our order. The rain came shortly after, swiftly causing small floods down the road and scattering the revelers of CarnaKep to shelter. Smaller children quickly lost their clothes and dashed out into the rain, dancing and chasing each other, giggling and turning up small faces to catch the drops. “It’s the first big rain we’ve had this season,” the waitress explained as she brought our crabs. Heather and I just nodded, reaching in for claws without waiting for the rice. As the first smear of sauce hit my tongue, I knew why this dish was so famous. The crabs were fresh and sweet, but the sauce was a symphony. Rich and smooth, piquant and tangy, it spread from crab over our fingers as fast as we could lick them off. Branches of Kep pepper lay witness on the plate after the massacre was complete; the rest of the sauce and every morsel of crab had been devoured as quickly as it had appeared. Sated, we silently watched the rain abate. 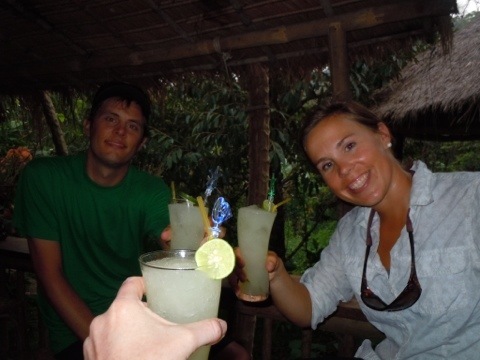 In that brief window, we ran to the tuk-tuk and retreated to the resort to watch the next bout of rain from the treehouse deck. It was a sensory-filled day, and one that will stick with me. The next parade that I witness will pale in comparison to CarnaKep and my Ferris-Bueller-moment and the next rainstorm that I savor from a covered deck will be flavored with the tang of Kep pepper crab. Tags: Cambodia, CarnaKep, Eco-resort, Kep, pepper. Bookmark the permalink. 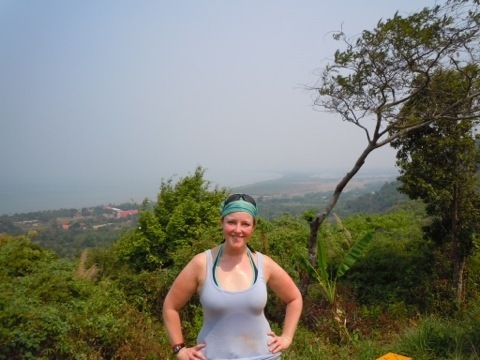 Glad you enjoyed your time in Kep and at The Vine Retreat.